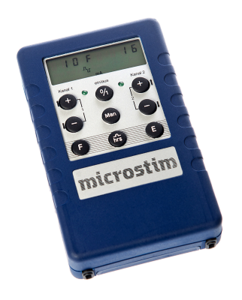 The MICROSTIM is a 2 channel stimulator designed for functional electrical stimulation (FES) as well as the treatment of muscle atrophy. The MICROSTIMs established design allows an easy and comfortable use in home environments. Six programs that can be modified easily offer the possibility to adjust the treatment precisely to the patient’s needs. Stimulation programs can be controlled manually or run completely automatic for a reliably and easy application with parameters previoulsy determined by an expert. A hand or foot switch can be utilized to trigger the stimulation. This enables the complete control of stimulation timing and duration. Furthermore, functional applications for the upper and lower extremities are possible. This includes grasping and releasing of objects as well as the treatment of drop foot.